On September 13th at the Holiday Inn located at 440 West 57th st. Dress sharp, bring at least 30 resumes, and invite your friends and family. Career City is helping the working class by bridging the gap between employers and America’s workforce. 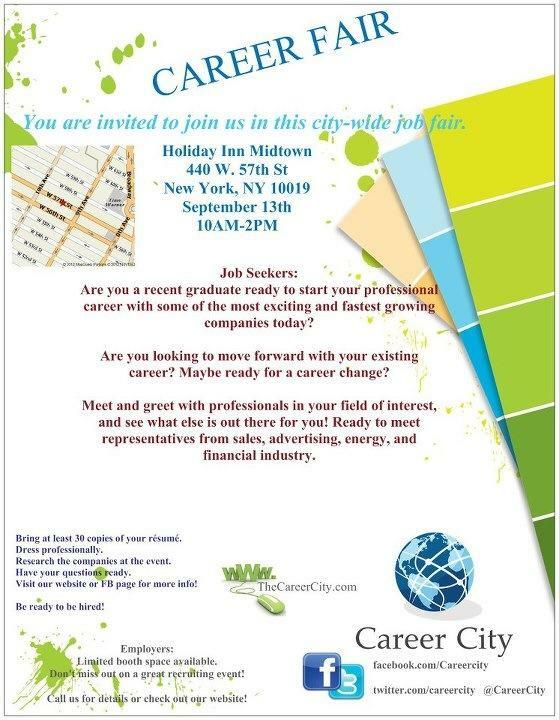 Like Career City on Facebook to receive news and update and subscribe to the newsletter on their website. We have job openings at one of my companies!! Great Employment for you resume. Hiring now! post to your facebook tell your friends!! Do you own a brick & mortar business, facilities or warehouse? Do you need any physical work done? ABCO Maintenance Inc. specializes in maintenance, construction and repair services. Abco Maintenance has been around for over 30 years and is trusted by many large well known store chains, malls, plazas and franchises. Abco Facilities Maintenance is a leading provider for the New York, New Jersey and East Pennsylvania area. You know how Facebook is blue, and you can just stay there for hours, and Macy’s website is red and you are in and out in a jiffy? I know that most of us have jobs and some of us have office jobs. There comes a time in every office job where the employee cannot concentrate. There comes a time that the employee has finished their work. There comes a time, when the employee is just plain bored. Ive just put this online to benefit you, your kids and the rest of the community. Efiza features 25 thousand games, and i periodically add new ones. By the way, this is not a 3rd party site.